Between 1993 and 2000 they released one EP, three full length LPs and ten singles on the Beastie Boys' Grand Royal label. Their biggest hit ?and only Billboard Top 40 entry? is "Naked Eye" (#36, March 22, 1997). Other notable singles include "Here", "CitySong (NY State Of The World)", "Under Your Skin" and "Ladyfingers". Vivian Trimble left the group in 1998, and in 2000 (after releasing one album as a trio) the group officially announced the break up of Luscious Jackson. 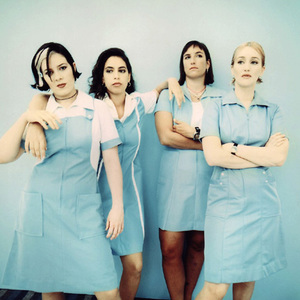 February 2007 saw the release of Luscious Jackson's "greatest hits" compilation, and in the fall of 2006 the band announced that they had reunited and were to release a new children's album, a plan which never came to fruition and the band ceased activity in 2007. In the January 2012 issue of "Rolling Stone" magazine, the band announced that they had reunited in late 2011 and would be recording a new album, funded by crowdsourcing.